Voles are mice-like rodents that feed on plants, seeds, bulbs and roots. A vole infestation can wipe out a perennial bed. A Cornell University Department of Natural Resources and Horticulture's study from Paul D. Curtis, Ph. D, Gwen B. Curtis and William B. Miller, Ph.D., presented in the July 1, 2009 “Horticultural Technology,” tested popular garden bulbs to determine which voles were least likely to eat. Several perennial bulbs proved highly unpalatable. Italian arum (Arum italicum) is a shade-loving perennial bulb suitable for USDA Plant Hardiness Zones 5 through 9 (minimum annual temperatures of minus 20 degrees F and higher). From 12 to 18 inches high and wide, it has arrowhead-shaped gray-green leaves up to 1 foot long. In April or May, it has a single spike (spadix) of white flowers, partially protected with a pale green hood (spathe). The hood and leaves die back after flowering, while the spike produces attractive red-orange berries. Leaves re-emerge in fall, remaining evergreen in areas with warm winters. Otherwise, they die and re-emerge in spring. The Missouri Botanical Garden recommends this perennial for shaded borders or woodland gardens. It needs partial to full shade and moist, humus-rich well-drained soil. 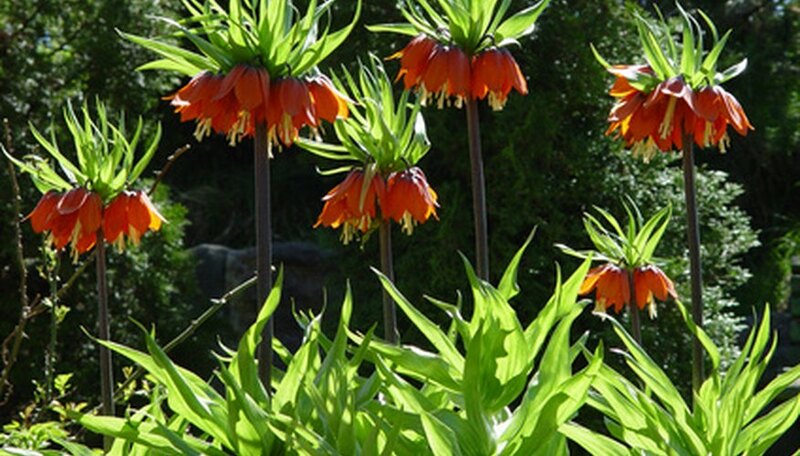 Crown imperial (Fritilleria imperialis), a lily family perennial, is hardy to minus 25 degrees F. Reaching 3 to 4 feet high and 18 inches wide, it has 6-inch leaves with attractive wavy margins on their lower halves. Foliage dies back after the plants finish blooming and go dormant. Between May and June, crown imperial puts on a spectacular show with a single-stem cluster of nodding yellow, orange or red bell-shaped flower. Flowers bear a crown of pineapple-like leaves. The plant's biggest drawback is a faintly skunk-like odor. The Missouri Botanical Garden recommends this bulb as a group planting for the backs of borders. Plant it 6 inches deep and 9 to 12 inches apart in full sun with some afternoon shade. It likes averagely moist, rich soil and heavy winter mulch. Prevent moisture from entering the bulbs by planting them sideways. A small but charming addition to the fall garden, autumn crocus (Colchicum) is hardy to winter temperatures of minus 30 degrees F. Its green springtime leaves have disappeared by the time the 6-to-9-inch plants bloom in fall with single stems of pink, lavender or white star-like flowers. The Missouri Botanical Garden recommends autumn crocus for edgings with ground covers to support its stems and hide the yellowing spring foliage. It's also effective for bringing fall color to spots where summer-blooming plants have faded. Plant autumn crocus bulbs 3 inches deep and 6 inches apart in August. It likes full sun to part shade and average well-drained soil. About Town: Are Voles Munching Your Garden?